Dogs, Cats, and other household domestic animals. Dogs and Cats must be house broken and all other pets must be caged. $25 Valet Trash, $5.00 Pest Control, Water is sub-metered based on usage. Would have to provide a 60-day written notice, pay termination fee and any concessions given. Lease will automatically default into a MTM after completion unless you renew or give a 60-day written notice. Currently 13-15months, subject to change. Yes. Contact the office for details. Yes, $100,000 liability and policy must list all adults on lease. You will contact the office, via phone call, email, or resident portal. Late fees begin on the 4th. Yes, you are responsible for payments getting into office on time. Yes, monthly cost associated with reserved parking. In any parking space designated for autos. Can I install my satellite dish at my apartment? With approval, additional deposit, and located inside patio/balcony on tripod. May not be attached to railings, building or grounds of community. No. The property will have 2 propane tank grills onsite for residents to use. Yes, we have breezeway access garages and storage units within the breezeways. Yes, we do not sign for packages, but we accept and send an email notification of package. We no longer call it a Preferred Employers. It is now called a Corporate Advantage Program. Yes, we waive the admin fee ($150). DIRECTIONS: From US-75 N Take exit 28A toward Plano Parkway. Merge onto N Central Expressway. Turn right onto Executive Drive. 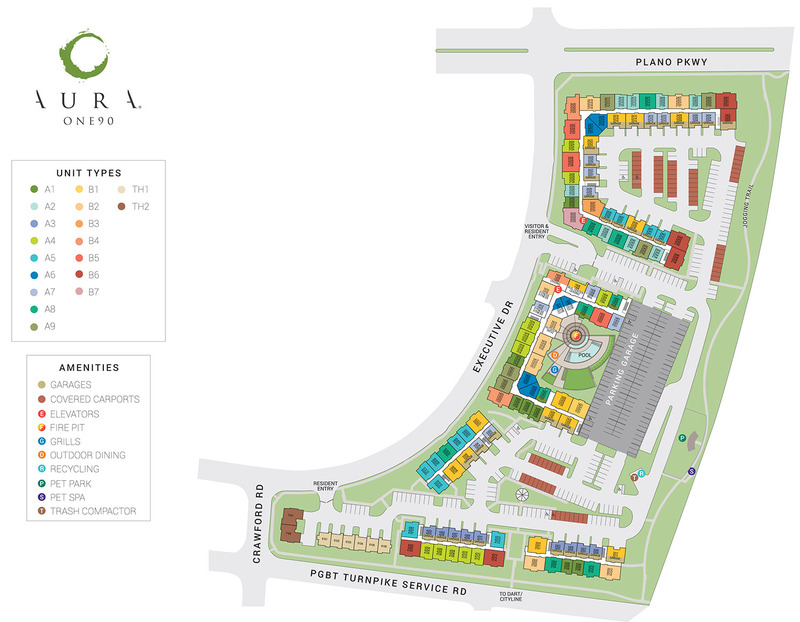 Aura One 90 Apartments in Plano will be on your right. For maintenance emergencies please call 972-423-0680, option 3. For all other emergenices please call 911. Located in the heart of the rapidly expanding Plano/Richardson 190 Corridor, Aura One90 is set to become the premier destination for luxury Plano, TX apartments. Each of our stunning one and two bedroom apartments and townhomes is lavishly appointed with granite countertops, stainless steel appliances, and luxurious garden tubs in the master bathroom. Imagine coming home to a luxury apartment community just across the street from CityLine in Richardson where access to a state-of-the-art fitness center, resort-style pool, and covered outdoor lounge & courtyard are all right at your fingertips. In addition, our Plano, TX luxury townhomes feature easy access to the intersection of Highway 75 and the George Bush Tollway, making any commute that much easier. Come home to Aura One90 today - you won’t find a more vibrant urban living experience anywhere else in the area than our South Plano luxury apartments near CityLine.